Books | Helping Hands Foundation, Inc. The following books may be of interest to members of the Helping Hands Foundation. Please note some of these books have links to Amazon. If you purchase books by following the Amazon links, a small percentage of the purchase price will be refunded to Helping Hands Foundation. All of the money earned through this affiliation will go directly into our general funds. Thank you! "Danny Crates’ story is about so much more than just another sportsman achieving his dreams. Telling how a young, carefree Essex boy comes back from losing his right arm to become a Paralympic gold medallist, the book covers all the highs and lows of Danny’s life. From the agony of the car crash on the other side of the world that cost him his arm at the age of 21, through a period of introspection as he came to terms with his disability, the achievement of becoming the world’s only one-armed scuba diving instructor, the glory of an athletics career spanning three Paralympic games, and his role as an ambassador for the London 2012 bid. "My name is Kevin Michael Connolly and I was born in Helena, Montana on August 18th, 1985. I was also born without legs. All my life I′ve been an object of curiosity, the subject of a stare. But, while I have shouldered the stares and stories of others, the story of how I′ve managed to travel the world is uniquely my own. DOUBLE TAKE is my story, and it begins in many ways the day I was placed on prosthetic stilts at the age of eight. In an attempt to capture the moments of intense curiosity I experience on a daily basis, I traveled to 17 countries and took over 32,728 photographs of people staring at me. In Zurich, I raced down the Limmat River against a group of twenty Vikings. In Bosnia, I scrambled to collect my groceries after being side swiped by a car. In Malaysia, I got caught in torrential rainstorms and had to skate and paddle with one hand, while keeping my camera above the rising tide with the other." Elmer the elephant is bright-colored patchwork all over. No wonder the other elephants laugh at him! If he were ordinary elephant color, the others might stop laughing. That would make Elmer feel better, wouldn't it? The surprising conclusion of David McKee's comical fable is a celebration of individuality and the power of laughter. Elmer the elephant, a colorful character because of his patchwork hide and sense of humor, tries to blend in with the herd, but soon realizes that he's happiest just being himself. "McKee's gentle humor and love of irony are in full force in this celebration of individuality and laughter." -- Publisher's Weekly. When Katie Kolberg met and married Todd Memmel, the two were young and unsure of what life might hand them; but they felt ready to find out together. While preparing for the birth of their first child, Todd and Katie had no idea that their son would be born missing part of his left arm. They both wondered how his life might unfold, but Katie had so many questions: Would her baby boy ever play sports or participate in music? Have friends? Fall in love? This is a mother's story of raising her child, born with a limb difference. 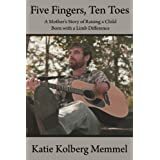 From his birth to college graduation, Katie openly shares her fears and faith, how their family met challenges head-on, numerous and awesome accomplishments; but mostly, the simple joy of raising her son, Tony Memmel. Born without a right hand, Jim Abbott as a boy dreamed of being a great athlete. Raised in Flint, Michigan, by parents who saw in his condition not a disability but an extraordinary opportunity, Jim became a two-sport standout in high school, then an ace pitcher for the University of Michigan. By Beverly Swerdlow Brown (Health Publishers; ISBN 0929173260) Oliver Octopus has only five arms, but a positive attitude which leads to a successful resolution to his lack of job problem in the book. Reading Level: Ages 4 -8. Order this Book through Amazon.com!